I’ve spent a lot of time over the last couple of weeks trying to reconcile what is wrong with me. Have I been unwell without realising it or is it possible that I simply don’t have a soul? Whatever the reason after trying my best I still don’t love Super Mario Odyssey and I might be the only person in existence who feels this way. Super Mario Odyssey is easily one of the most anticipated Switch titles this year and sees a return to 3D Mario gameplay which we haven’t really seen since the Galaxy series. Boasting open worlds filled with secrets and collectables, Odyssey takes us back even further with many relating it to Sunshine and others even calling it the first true Mario 64 successor. It’s universally loved for its exploration and innovative gameplay receiving perfect scores across many reviews and I’m still, at best, whelmed. 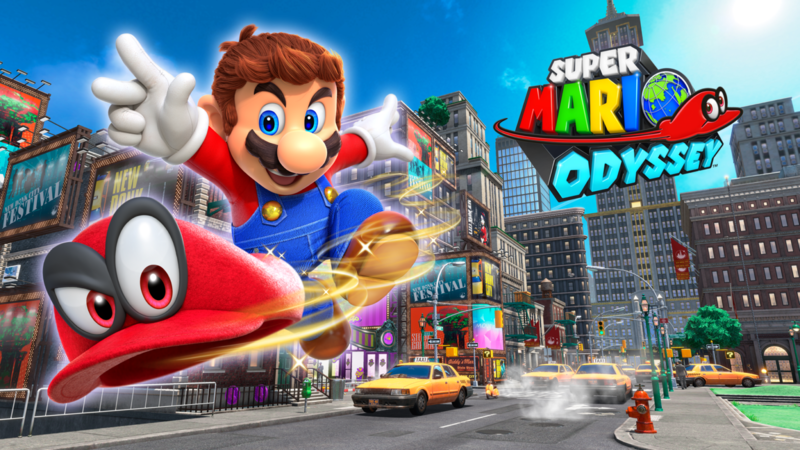 The biggest difference between this and other Mario titles is the introduction of Cappy, Mario’s new hat. This brings with it some interesting new mechanics, most importantly, allowing you to capture and possess different characters. Each world in Odyssey features its own style and usually comes with a few unique capture options which are purpose-built for getting through the level. Once you capture a new creature or thing the way forward is usually fairly clear after learning the new controls. It’s hard to describe this and not make Mario Odyssey sound great. You can be a dinosaur, or a fish, or even electricity! Even talking about it now has me building mental hype for the game and I already know how I actually feel about it. What I don’t like about these captures is that they feel shallow. Suddenly having some new control options feels exciting but then also suddenly limited. By the time I’d gotten the hang of how a new body worked it was onto something different which left me feeling jarred and incomplete rather than carrying fresh momentum. I stopped being excited every time I saw something new and rather had a sense of tedium over once again having to learn new but incredibly basic controls. Mario on the surface felt just this to me, basic. There was so much promise of exploration but the worlds feel so contained that even though I know there are secrets I’ve missed they seem small. More often than not if I did find myself exploring for the sake of it I’d be rewarded by a silly death and then respawn miles from where I’d ended up. Nintendo talked so much about rewarding players for exploration like what we saw in Zelda but I almost always felt punished for my efforts. This is odd to say because for the main quest at least Odyssey is quite easy. This isn’t a bad thing, lots of kids are going to play this game and it’s great that every player will likely have the ability to get through the main story. Easy also doesn’t mean not fun, some games can provide this through a sense of wonder, discovery, and fluidity of control but I found little of this. Despite the difficulty, I died a lot. I always feel that good games teach you something from death, you die but you understand why and can try to do better next time. Odyssey taught me not to trust its camera or to be more careful when exploring. Odyssey taught me that the controls don’t quite do what I want them to. Odyssey taught me to be lucky or to go back to the beginning of the level. Odyssey taught me how to be angry. Power Moons are the most sought-after collectable that allows you to progress to new worlds. There’s around 1000 of them but you can complete the main quest with under 150. They are littered all over the world with some offering as little a challenge as jump on this bump and others asking for fiendish tasks. Mechanically this is incredibly sound and again allows for the accessibility which a Mario title needs. How this made me feel, on the other hand, was lacking. I’m no completionist unless I really love a game, so giving me the same reward for the smallest of tasks as well as the hardest makes me wonder why I bother. Sure there’s a self-satisfaction to the achievement but not enough of one to really encourage the effort involved for just another moon. I realise how incredibly negative this review leans but it’s not that Mario Odyssey is a bad game it’s just an ok one. For me it’s not the wondrous adventure of exploration that was promised, it’s a slightly above average platformer with some really good but ultimately unfleshed out ideas. My understanding is that the true game begins after the main quest but I really didn’t want any more and haven’t picked it up since. I must be permanently wearing a hat because according to this game’s logic, my attention was impossible to capture. This review was originally published here.